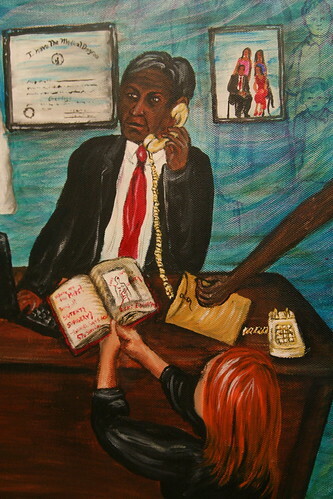 No, I havn't blogged “Office Hours.” This is a painting depicting one of the worst moments of my life. When Fred was in the hospital, I spent weeks asking for information and getting very few answers. During the second week of hospitalization we desparately needed Fred’s disability paperwork filled out. Fred’s oncologist rarely came to the room, so the social worker said she could fill most of it out for the doctor. The doctor became very angry that we had gone around him to get the paperwork completed. He was also angry that I was asking questions. He went to my husband and saying, “I understand Little Miss A-Type Personality has been asking questions about this case.” Fred said yes, that I had been asking questions. The Doctor said, “Well, if she wants answers about this case, she should come to my office hours.” When I arrived to Fred’s room, he was very angry with me and worried that his care may become worse, since I had asked so many questions. I felt very torn, between wanting to please my husband and knowing that something was going very wrong in the way he was being cared for. The next day I went to the Doctor’s office hours. I looked up at him as hid behind a computer screen. I looked at his medical degrees and awards on his right side and his family portrait on the wall to his left. I looked at that family portrait on the wall and I saw our little family. I saw him shatter our family like glass. We weren’t an important part of his day. A moment that changed my life forever was only one more appointment in his over-scheduled work-week. So that is the story of “Office Hours.” And I think it is important that you know that story before you see my jacket for The Walking Gallery. It is important that you know about it, even before you consider the concept of The Walking Gallery. For the last two weeks people have been asking me why paint business jackets and women’s blazers. Why not paint on a jean jacket or a tee-shirt? Why ruin a perfectly good suit? We paint on dress jackets because it is disruptive and somewhat wrong. Anyone who lived through the eighties can remember painting on jean jackets and tees, and recognize the societal approval of painting on such low class items. I still remember begging my Mom for a jean jacket for Christmas, and I seeing my mother’s consternation that I would want to pay good money for a garment that looked like something a farm hand would wear. When I first began my advocacy work, I would attend events in my best Church dresses. It didn’t take long for me to feel completely out-of-place. I was not wearing the right uniform. I soon invested in the appropriate women’s blazers and felt an appreciable difference in how I was treated at events. I had adopted the conference uniform and now I could play with the form. To Paint on jackets that are worn at medical conferences, is to bring street-art into the c-suite; this introduces the gritty urban danger, the unpredictable element into the room. This is keeping it real. And the business suit art that forms the body of The Walking Gallery is far more subversive than just gaining entry into the ivory tower and boardroom. This is taking a care paradigm and re-interpreting it. I know so many patients who suffered in silence while the world turned its back on their suffering. 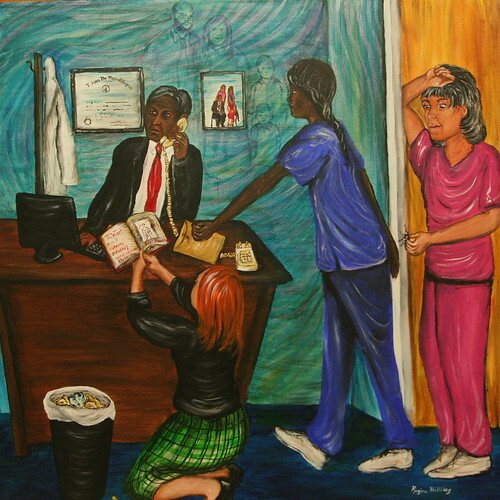 Now, when you turn your back on a patient you are actually communicating at a far deeper level, for on your back you portray the patient voice. So, a doctor who wished to keep me small named me “Little Miss A-Type Personality.” I will embrace the moniker, and I will walk the halls of medicine wearing a scarlet letter. 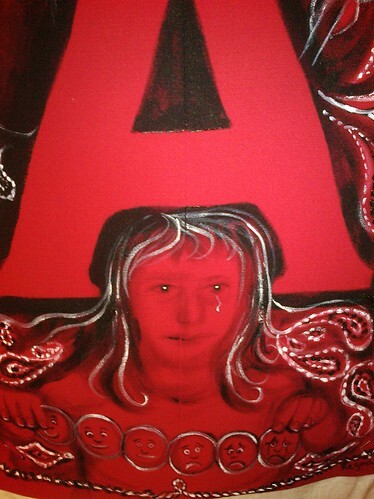 I will wear an "A" for the artist I am. 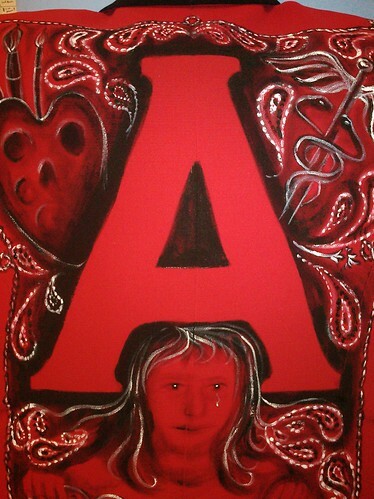 Any artist with a capital "A" suffers greatly for her art. I will paint my pictures with pigments mixed with tears. 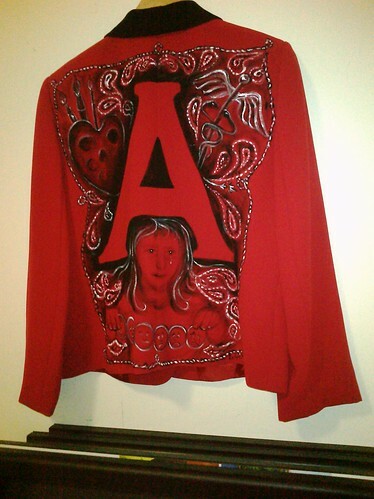 This painting harnesses darkness, as I painted this jacket utilizing the power of negative space. As defined by Wikipedia. "Negative space can be used to depict a subject in a chosen medium by showing everything around the subject but not the subject itself. Usage of negative space will produce a silhouette of the subject." I think this method of painting is very applicable to patients, as we are often left out of the big picture, and our presence is often defined by the space that is left empty and HIPAA compliant. This is why I paint. This is why I speak, so others shall not suffer as we did. I hope is so doing to take a negative space and turn it into a positive one. For every action there is an equal and opposite reaction. I hope the work we are doing this day can respond to all those other days when we suffered so. Simply awful...and you painted it so beautifully. The detail and symbology. We need to make a book! The artwork makes this terrible story more poignant. I think you should name this doctor by name so others can be aware of this. Another moving collection of images and words, and a powerful demonstration of aikido. People tend to ask themselves the wrong questions. And if you ask yourselves the wrong question, it doesn't matter how good the rest of your work is. Great answer! Wrong question. What I see often is that the more expert the individuals are, the better doctors they are, the better engineers they are, the more learning they have, the more reputation they have, is that they tend to ask questions that they already know the answers to.